Russia’s Benny Goodman brings his big band of first-class performers back to America. Jazz great Igor Butman is still in love with America. His feelings toward the U.S. have not changed since he first moved to Boston when he was a student at the Berklee School of Music more than 25 years ago. Butman later lived in New York, but has been back in Russia for many years. He has collaborated with Wynton Marsalis and Grover Washington Jr., both of whom championed Butman and his meteoric rise in jazz. When he arrives in the United States to tour — as he will this month — he says he feels at home. “I begin to breathe the same way I breathe back in my native St. Petersburg,” he said in an interview with RBTH. “The U.S. remains the country that’s very valuable for me. I have my own circle. And with friends, one can never be bored,” he said, chuckling. “To attempt to surprise the audience is a very big responsibility, especially for a Russian jazz orchestra. I’m very pleased that we seem to succeed,” he added. On September 20, Butman begins a Northeast tour when he plays with his band in Philadelphia’s famed Chris’ Jazz Café. The tour moves to New Jersey and then New York to the historic Village Underground. On Oct. 7, Butman will appear at the American-Russian Cultural Cooperation Foundation Annual Gala in Washington, D.C. with his friend and champion, Wynton Marsalis. The next day, he will perform at the Library of Congress, as part of the presentation of the U.S.-Russia Rising Stars Jazz Band. According to Susan Carmel Lehrman, Chair of American University’s Initiative for Russian Culture (AU IRC) and one of the organizers of the event: “Our third annual event at the Library of Congress is an American-Russian tribute to jazz diplomacy that spotlights the special cultural relationship that exists through jazz between Russia and the United States". "Through events like these, this Initiative will help promote a greater understanding of the richness and diversity of Russian culture to over 10,000 students and guests throughout the Washington Metropolitan area,” she added. Added Dr. Anton Fedyashin, Executive Director of the AU IRC, "We are thrilled that Mr. Butman has agreed to share his spectacular talent with our students. He is a living reminder of how much the US and Russia have in common culturally and how much they can achieve by cooperating in the realm of the arts." According to the virtuosic musician, the U.S. and Russia are much closer to each other in their understanding of jazz than either country is with Europe, which has its own distinct perception of jazz, the musician said. But in the last 20 years, jazz has proliferated in Russia’s urban centers. Jazz departments were opened in conservatories. There is a lack of trained jazz trumpeters and saxophone players in Russia of Butman’s generation. However he said there are at least a dozen emerging great musicians. Observers say that Butman, a longtime performer at the Olympics, was insturmental as a liaison with the Olympics committee when Sochi was being considered for 2014. He is slated to perform during the Sochi Winter Olympics that begin in February 2014. Supporting jazz prodigies is important to Butman, clearly. He organizes festivals, most notably the Aqua Jazz Festival in Sochi every August, where he “invites young very gifted people.” That includes a 16-year-old who play blues harp whose name is Misha Gafeman. Butman owns two jazz clubs in Moscow, one in the Clean Ponds “Chistye Prudy” neighborhood, and another in the nearly pastoral Sokol district. Both venues are known to draw large crowds to standing room only. His current program is an “all hits” program. 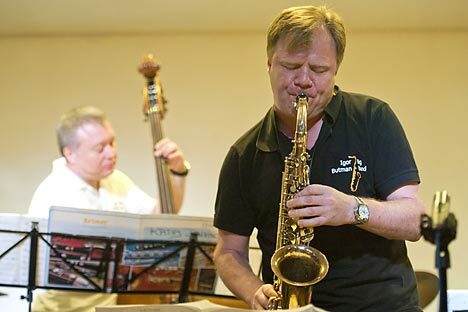 Igor Butman was born in 1961 in Leningrad (now St.Petersburg). He started playing the clarinet at the age of 11. In 1976 he entered the Rimsky-Korsakov College of Music, where during his second year he dropped the classical clarinet for the jazz saxophone. Besides being taught by the remarkable musician and brilliant teacher Gennady Goldstein, he took unofficial lessons from nightly broadcasts of jazz from 11:15 p.m. to midnight on Voice of America. In 1983, Igor Butman played in Oleg Lundstrem`s big band; the next year he was invited by Nick Levinovsky to join the most well known jazz group named Allegro. After Igor Butman immigrated to America in 1987, he went on to major in Performance and Composition at Berklee College of Music. After he moved to New York in 1989, Butman worked with The Lionel Hampton Orchestra. In 1993, he returned to Russia and became “a jazz bridge between Moscow and New York,” playing in Russia with Eddie Gomez, Lenny White, John Abercrombie, Joe Lock and many others.